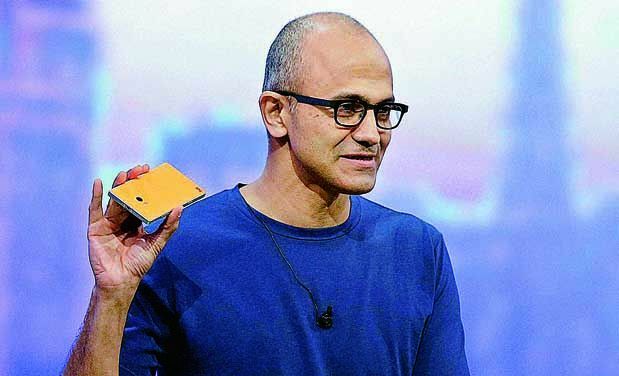 Satya Nadella recently launched his first book ‘Hit Refresh‘ and to promote the book, Nadella visited India where at the India Today Next Conclave conference, he shared the stage with cricketer Anil Kumble and even discussed the company’s consumer approach. During his keynote, Nadella described how the new Microsoft works to empower all users regardless of the operating system. While Microsoft has turned into an enterprise-focused company, the company still cares about the consumers and Satya Nadella has explained that Microsoft’s consumer approach is different from what Apple and Google are doing. Microsoft’s devices and services allow the customers to create new technology while the rivals deliver products to address the consumers needs, Nadella explains. “Whenever we have done things that come naturally to us we’ve been successful. Even if it’s a consumer product it is a tool. I fell in love with Microsoft technology because of what it created,” Nadella said. He explains that he hasn’t planned to take away the success from Apple and Google, because Microsoft is a very different company, this is why we are seeing Microsoft’s services on the rival mobile platforms. Nadella’s statement clearly mentions that Apple is a luxury company, unlike Microsoft. The ‘luxury good manufacturer’ recently release iPhone X and it is the most expensive model ever released. While Microsoft’s own Surface Book is also expensive as they are priced above $3,000. “You take a look at what we did with Groove and Spotify. Look at the Harmon Kardon speaker. In some sense, it is a fantastic Cortana speaker but also for Spotify. The last time I checked there were a lot more Spotify people than Groove people. So let us bring the best of what Microsoft has to a Spotify user and create consumer fans. So that’s the approach we want to take,” he added. The problem is that–as tools–the Google and Apple solutions are dull blades. Give me my Windows on my phone. Microsoft is now more like IBM. Only for business. In other words, MS has become a sell-out.